CD70 is expressed in normal activated immune cells as well as in several types of tumors. It has been established that anti-CD70 mAb induces complement-dependent death of CD70+ tumor cells, but how anti-CD70 mAb affects the intrinsic signaling is poorly defined. In this report, we show that ligation of CD70 expressed on EBV-transformed B cells using anti-CD70 mAb induced production of reactive oxygen species (ROS) and subsequent apoptosis. We observed an early expression of endoplasmic reticulum (ER) stress response genes that preceded the release of apoptotic molecules from the mitochondria and the cleavage of caspases. CD70-induced apoptosis was inhibited by pretreatment with the ER stress inhibitor salubrinal, ROS quencher N-acetylcysteine, and Ca2+ chelator BAPTA. We supposed that ROS generation might be the first event of CD70-induced apoptosis because N-acetylcysteine blocked increases of ROS and Ca2+, but BAPTA did not block ROS generation. We also found that CD70 stimulation activated JNK and p38 MAPK. JNK inhibitor SP600125 and p38 inhibitor SB203580 effectively blocked upregulation of ER stress-related genes and cleavage of caspases. Inhibition of ROS generation completely blocked phosphorylation of JNK and p38 MAPK and induction of ER stress-related genes. Taken together, we concluded that cross-linking of CD70 on EBV-transformed B cells triggered ER stress-mediated apoptosis via ROS generation and JNK and p38 MAPK pathway activation. Our report reveals alternate mechanisms of direct apoptosis through CD70 signaling and provides data supporting CD70 as a viable target for an Ab-based therapy against EBV-related tumors. The endoplasmic reticulum (ER) is the primary organelle for proper protein synthesis, folding, and assembly as well as for calcium storage. The accumulation of unfolded or misfolded protein or alterations in Ca2+ homeostasis in ER can induce ER stress and ultimately lead to apoptosis (1). As a protective mechanism, ER triggers the unfolded protein response (UPR) to protect cells against ER stress (2). UPR is mediated by one ER chaperone, glucose-regulated protein 78 (GRP78), and three ER transmembrane proteins, PKR-like ER kinase (PERK), inositol-requiring ER-to-nucleus signal kinase 1 (IRE1), and activating transcription factor 6 (ATF6) (3, 4). Activated PERK blocks general protein synthesis by phosphorylating eukaryotic translation initiation factor 2 subunit-α (eIF2-α), and IRE1 splices X-box binding proteins-1 (XBP-1) mRNA. All three arms of the UPR act together to induce transcription of c/EBP homology protein (CHOP), which is a key proapoptotic transcription factor (5). ER mediates apoptosis via several different mechanisms. Among these, exchange of calcium between the mitochondria and the ER plays a major role. Mitochondria and ER are major internal Ca2+ storage organelles and act as Ca2+ buffers that regulate Ca2+-dependent signaling in the cytosol. Increase in cytosolic Ca2+ concentration occurs at both early and late stages of the apoptotic pathway (6). Several pathologies are closely related to the disruption of Ca2+ homeostasis (7). The release of Ca2+ from ER and its uptake into mitochondria is strictly controlled by Ca2+ itself or an expanding group of messengers, such as inositol-1,4,5-triphosphate (8). When calcium is taken into the mitochondria, it decreases the mitochondrial membrane potential and causes the release of cytochrome c, consequently activating various apoptotic pathways (9). Another mechanism has been suggested whereby the ER itself is capable of initiating cell death signals. Human caspase-4 (counterpart of murine caspase-12) induces ER-mediated cell death and has recently been identified as a mediator of ER stress (10–12). Another possible mechanism of ER-mediated apoptosis is associated with endogenous Bcl-2 family members including Bcl-2, Bcl-xL, Bax, Bak, and Bik (13, 14). Bax/Bak-deficient mouse embryonic fibroblasts are resistant to both mitochondrial-mediated apoptosis and ER stress stimuli (15). In addition, overexpression of Bax and Bak leads to Ca2+ efflux from the ER. These investigations suggest that there is cross talk between the ER and the mitochondria and that this is involved in the regulation of cell death. CD70, the ligand for CD27, is a type II glycoprotein and a member of the TNF superfamily whose expression is tightly regulated and only transiently induced on Ag-stimulated B and T cells (16). Interaction between CD70 and its receptor CD27 regulates the differentiation of effector and memory T cell populations and B lymphocyte function (17, 18) and may be involved in maintaining CD8 memory T cell responses (19, 20). In normal B cells, CD70–CD27 costimulation promotes B cell expansion, germinal center formation, and plasma cell differentiation. Notably, CD70 is expressed by a variety of transformed cells of both hematopoietic and epithelial cell origin. EBV-positive B cell lymphomas, B cell lymphocytic leukemias, and Waldenstrom macroglobulinemia, as well as Hodgkin disease Reed–Sternberg cells (21–23), express CD70. CD70 was also detected in solid tumors, such as nasopharyngeal carcinoma. Additionally, CD70 has been found on EBV-negative thymic carcinoma, astrocytoma, and glioblastoma, as well as renal cell carcinoma (24). Therefore, it is considered an attractive target for cancer immunotherapy. Many studies have recently reported that anti-CD70 mAb–drug conjugates have anticarcinoma activity and have suggested that CD70 is a potential therapeutic target (24–27). However, mechanisms of cell death using anti-CD70 Ab are yet unclear. Like rituximab, anti-CD70 Abs induce complement-dependent cell death of CD70+ lymphoma (26). CD70 also stimulates PI3K signaling in B cells and MAPK signaling in T cells (28, 29), although CD70 has a short cytoplasmic tail. These reports support the possibility of directing apoptosis through signal transduction after CD70 stimulation. Stimulation by Ab against surface Ag provokes various events such as Ca2+ release, caspase activation, and reactive oxygen species (ROS) generation, similar to what was found in our previous study showing that anti–B7-H1 Ab stimulates ROS generation and subsequent JNK activation (30). We hypothesized that CD70 stimulation would increase ROS generation and subsequent apoptosis. Calcium is not only closely linked to both oxidative stress and cell death (1) but is also deeply related to ER stress. Thus we tried to examine whether calcium and ER stress were involved in signaling through CD70. In this report, we demonstrate that ∼90% of EBV-transformed B cells were CD70+CD19+. Using EBV-transformed B cells as a model of CD70+ lymphoma, we examined whether cross-linking of CD70 using anti-CD70 mAb would induce apoptosis and investigated some targets such as ROS, ER stress, MAPKs signaling pathway, and apoptotic molecules relevant to apoptosis. Our data suggest that anti-CD70 mAb may potentially be useful for treating CD70+ malignancies, and we provide data in support of CD70 as a viable target for an Ab-based therapy against EBV-related tumors. EBV supernatant stock was prepared from an EBV-transformed B95-8 marmoset cell line. PBMCs were isolated from human whole blood by Ficoll-Paque (Amersham Life Science, Buckinghamshire, U.K.) gradient centrifugation. B cells were purified using a MACS B cell purification kit (Miltenyi Biotec, Auburn, CA). Purified cells were added to EBV stock supernatant in a culture flask, and after 2 h of incubation at 37°C, RPMI 1640 (1 μg/ml cyclosporine A) was added. The cultures were incubated for 2∼4 wk, and the phenotype was monitored using a FACSCalibur flow cytometer (BD Biosciences, San Jose, CA). EBV-transformed cells (4 wk, 5 × 105 cells/ml) were harvested and washed twice in cold PBS. Cells were incubated with mouse anti-CD70 mAb (clone Ki-24, IgG1κ; BD Biosciences) or isotype control (clone MOPC21, IgG1κ; Sigma-Aldrich, St. Louis, MO) at 37°C for 40 min. For cross-linking of anti-CD70 mAb to increase CD70 downstream signals, cells were then incubated with goat anti-mouse IgG (Sigma-Aldrich) for 15 min at 37°C. After cells were washed, they were further cultured in RPMI 1640 at 37°C. To determine optimal conditions of CD70 stimulation, experiments were performed at variable concentrations (100, 500 ng/ml, and 1, 2, and 5 μg/ml) and durations (10 min, and 2, 4, 8, 16, 24, and 48 h). In most experiments, 1 μg/ml primary Abs and 2 μg/ml goat anti-mouse IgG were used. For evaluating association with caspases, cells were pretreated with z-VAD-fmk (20 μM), z-DEVD-fmk (20 μM), or DMSO (vehicle control, identical volume) for 2 h before CD70 stimulation. To inhibit ROS generation, cells were pretreated with N-acetylcysteine (NAC; 10 mM; Sigma-Aldrich) for 1 h. To block JNK, ERK1/2, or p38 MAPK cascade, cells were pretreated with SP600125 (25 μM), PD98059 (10 μM), or SB203580 (10 μM) respectively for 1 h before CD70 stimulation. For preventing ER stress, cells were pretreated with salubrinal (2 μM) for 1 h. All chemicals except NAC were purchased from Calbiochem (San Diego, CA). All chemicals were removed from cell cultures before CD70 stimulation. Cells were harvested and washed twice with PBS and resuspended in 100 μl annexin V binding buffer (10 mM HEPES, 0.14 M NaCl, and 0.25 mM CaCl2). Then, 2 μl FITC-conjugated annexin V (BD Pharmingen) and 2 μl propidium iodide (PI; BD Pharmingen) were added, and cells were incubated at room temperature for 15 min in the dark with gentle vortexing. Then, 400 μl of 1× binding buffer was added to each tube, and cells were analyzed using a flow cytometer. Quantitative changes in mitochondrial membrane potential (△ψm) in cells were measured using 3,3′-dihexyloxacarboxyanine iodide (DiOC6; Molecular Probes, Eugene, OR). Cells were harvested, washed twice in PBS, resuspended in PBS supplemented with DiOC6 (20 nM), incubated at 37°C for 15 min in the dark, and immediately analyzed by flow cytometry. The intracellular accumulation of ROS was determined using DCFH-DA (10 μM; Molecular Probes). Cells were pretreated with 10 μM DCFH-DA and then stimulated with anti-CD70 Ab or MOPC21. Cells were harvested, and ROS levels were determined using a flow cytometer. The results were presented as mean fluorescence intensity (MFI). Cytosolic Ca2+ levels were determined using the fluorescent dye fluo-3-acetoxymethyl ester (fluo-3-AM; 5 μM; Molecular Probes). Cells were incubated with fluorescent dyes for 15 min at 37°C, washed with calcium-free Dulbecco’s PBS, and analyzed by flow cytometry. 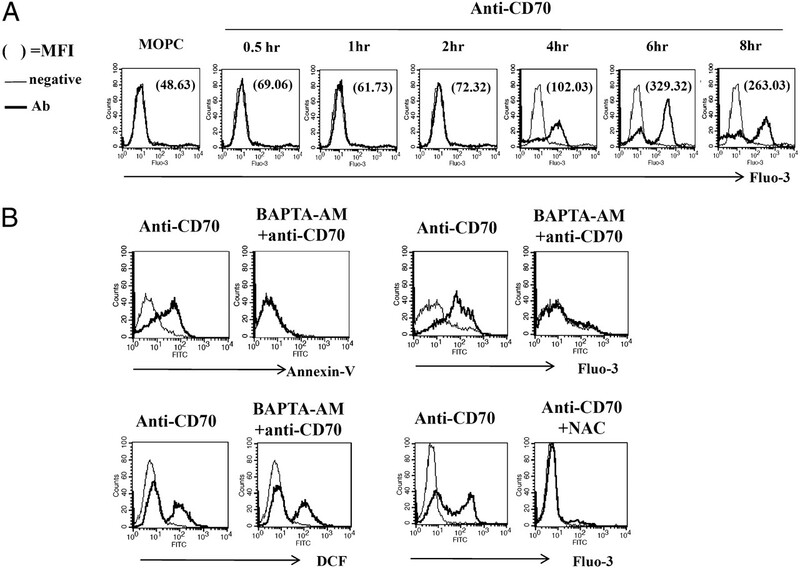 Cells were pretreated with BAPTA-AM (2 μM; Sigma-Aldrich) for 30 min before CD70 stimulation. To detect the sub-G1 peak, BrdU/PI staining was performed with FITC–BrdU Flow kit (BD Biosciences). Briefly, cells were incubated in culture medium containing 10 μM BrdU and stimulated with anti-CD70 mAb with or without NAC. Cells were collected and washed according to the instructions supplied by the manufacturer. Cells were then fixed with BD Cytofix/Cytoperm for 5 min on ice, treated with DNase for 1 h at 37°C, and incubated with anti-BrdU–FITC for 30 min. Finally, cell pellets were stained with PI staining solution containing RNase A (10 mg/ml; Sigma-Aldrich) and PI (2 mg/ml) in PBS. The cell suspension was then incubated in the dark at room temperature for 20 min. BrdU incorporation and DNA content was determined using a FACSCalibur flow cytometer (BD Biosciences, San Jose, CA). Total RNA was isolated using an RNeasy Mini kit (Qiagen, Hilden, Germany). RNA was transcribed into cDNA using oligonucleotide primers and reverse transcriptase. To investigate apoptosis-associated molecules, PCR amplification was performed using specific primer sets (Bioneer, Daejeon, Korea) for FasL, Bcl-2, Bax, Bad, Bip, CHOP, sXBP-1, GADD34, ATF4, and β-actin (Table I). PCR was performed using Prime Taq Premix (GeNet Bio, Chungnam, Korea). PCR products were analyzed by agarose gel electrophoresis and visualized with ethidium bromide under ultraviolet light using the multiple Gel DOC system (Fujifilm, Tokyo, Japan). Data were analyzed using ImageJ 1.38 software (National Institutes of Health, Bethesda, MD). Quantitative real-time RT-PCR was performed using a single-tube SYBR Green kit (Takara, Tokyo, Japan), iCycler thermal real-time PCR system (Bio-Rad Laboratories, Hercules, CA), and specific primer sets (same primers used in conventional RT-PCR). Only experiments where a distinct single peak was observed with a melting temperature different from that of the no template control were analyzed. The relative gene expression compared with unstimulated cells was determined by the iCycle iQ real-time detection system software's built in algorithm (Bio-Rad Laboratories) using an adaptive baseline to determine the threshold cycle (Ct). mRNA fold induction values were calculated by the following equation: △Ct = Cttarget − Ctβ-actin, △(△Ct) = (△Ctstimulated − △Ctcontrol), mRNA fold change = 2−△(△Ct). Experiments were performed in triplicate, and data were expressed as means ± SD. Cells were harvested and lysed in Radio Immuno Precipitation Assay buffer (Elpis Biotech, Daejeon, Korea) containing a protease inhibitor mixture (Elpis Biotech, cat. no. P2714, contents: 4-[2-aminoethyl]benzenesulfonyl fluoride hydrochloride, aprotinin, bestatin hydrochloride, N-[trans-epoxysuccinyl]-l-leucine 4-guanidinobutylamide, EDTA, leupeptin hemisulfate salt) and phosphatase inhibitor (Sigma-Aldrich, cat. no. P5726, contents: sodium orthovanadate, sodium molybdate, sodium tartrate, imidazole). Total cell lysates were subjected to SDS-PAGE. Separated proteins were transferred to nitrocellulose membranes (Millipore Corp., Billerica, MA), the membranes were blocked with 5% skim milk, and conventional immunoblot was performed using several Abs. Chemiluminescence was detected using an ECL kit (Amersham Life Science) and the multiple Gel DOC system (Fujifilm). The following primary Abs were used: caspase-8, caspase-3, caspase-9, β-actin, Bid, Bcl-2, Bcl-XL, phospho-JNK (Thr183/Tyr185), JNK, phospho-ERK1/2 (Thr202/Tyr204), ERK1/2, phospho-p38 MAPK (Thr180/Tyr182), and p38 MAPK from Cell Signaling Technology (Beverly, MA); GRP78, GADD153, Hsp60, cytochrome c, phospho-PERK (Thr981), PERK, phospho–c-jun, and c-jun from Santa Cruz Biotechnology (Santa Cruz, CA); caspase-4 from Abcam (Cambridge, U.K.); β-tubulin from BD Pharmingen; and poly(ADP-ribose) polymerase (PARP) from Upstate Biotechnology (Lake Placid, NY). Data were analyzed using ImageJ 1.38 software. Mitochondrial versus cytosolic fractions of cells were prepared using a Cytosol/Mitochondria fractionation kit (cat. no. QIA88, Calbiochem). All chemicals were supplied by the manufacturer. Briefly, cells were harvested by centrifugation at 600 × g for 5 min at 4°C and washed twice with cold PBS. Afterward, cells were resuspended in 250 μl cytosol extraction buffer containing protease inhibitor mixture (included in fractionation kit) and 1 mM DTT. After incubation on ice for 10 min, cells were homogenized using a Dounce tissue homogenizer on ice. Homogenates were centrifuged at 700 × g for 10 min at 4°C, and the supernatant was centrifuged again at 10,000 × g for 30 min at 4°C. The resulting supernatants were harvested and designated as cytosolic fractions, and the pellets were resuspended in 50 μl mitochondria extraction buffer containing protease inhibitor mixture and DTT and designated as mitochondrial fractions. To estimate the level of CD70 expression on B cells during infection by EBV, EBV-infected B cells were harvested every week for 4 wk when the transformation process was completed. Cell phenotype was observed by flow cytometry. CD70 was minimally expressed on the surfaces of CD19+ resting B cells and was mildly expressed in the cytoplasm of CD19+ resting B cells (Fig. 1, top). After 4 wk of EBV infection, CD70 expression was significantly increased in transformed B cells; most of the EBV-transformed B cells highly expressed CD70 molecules on the cell surface and in the cytoplasm (Fig. 1, bottom). Expression of CD70 protein on EBV-transformed B cells. Resting B cells purified from human blood were immortalized with a medium containing EBV particles. Cells were stained with FITC-conjugated mouse anti-human CD70 and PE-conjugated mouse anti-human CD19 and analyzed by flow cytometry as described in Materials and Methods. Scattergrams on the left represent surface expression, and those on the right represent intracellular expression. We first tested cell proliferation using AlamarBlue (Serotec, Raleigh, NC) assay after stimulation of CD70 on EBV-transformed B cells. After stimulation of CD70 using both anti-CD70 mAb (Ki-24) and secondary Ab, we investigated the inhibition of cell proliferation (data not shown). Subsequently, we examined whether the inhibition of cell proliferation was related to cell death. EBV-transformed B cells were incubated with anti-CD70 mAb (IgG1κ) or isotype control (MOPC21, IgG1κ) and secondary Ab. We found that CD70 ligation with anti-CD70 mAb enhanced apoptosis in a dose- (Fig. 2A) and time-dependent (Fig. 2B) manner. Annexin V-positive cells were slightly increased 8 h after CD70 stimulation, half of cells were annexin V positive at 24 h (55.04%; Fig. 2B, top), and two-thirds of cells were annexin V-positive at 48 h (73.79%; Fig. 2B, top). Apoptosis and disruption of membrane potential of mitochondria in EBV-transformed B cells after CD70 stimulation. A, EBV-transformed B cells (4 wk) were incubated with anti-CD70 mAb (0.1, 0.5, 1, 2, and 5 μg/ml) or MOPC21 (5 μg/ml) at 37°C for 40 min. Cells were washed and incubated with goat anti-mouse IgG (2 μg/ml) at 37°C for 15 min. Cells were harvested and further incubated in medium. Twenty-four hours later, cells were stained with FITC-conjugated annexin V and PI. B, EBV-transformed B cells (4 wk) were incubated with anti-CD70 mAb (1 μg/ml) or MOPC21 (1 μg/ml) at 37°C for 40 min. Cells were washed and incubated with goat anti-mouse IgG (2 μg/ml) at 37°C for 15 min. Cells were harvested and further incubated in medium for 10 min or 2, 4, 8, 16, 24, or 48 h. To determine degree of apoptosis, cells were stained with FITC-tagged annexin V and PI. The indicated number represents the cell proportion in each quadrant. To survey disruption of membrane potential of mitochondria, cells were stained with DiOC6; diminished DiOC6 fluorescence indicates disruption of membrane potential of mitochondria. Negative groups indicate no treatment with any mAb. A representative example of five independent experiments is shown. We investigated whether CD70-mediated apoptosis was associated with change in the membrane potential (△ψm) of mitochondria, which is primarily related to apoptosis. Cells were pretreated with DiOC6 to investigate △ψm. Disruption of membrane potential of mitochondria was undetectable until 4 h after CD70 stimulation. Eight hours after CD70 stimulation, both disruption of membrane potential of mitochondria and apoptosis dramatically increased (Fig. 2B, bottom). When EBV-transformed B cells were stimulated with CD27 (4 μg/ml, 24 h) as a physiologic ligand of CD70, CD27-Ig fusion protein recapitulated apoptosis and mitochondrial disruption induced by anti-CD70 mAb (Supplemental Fig. 1). Next, we characterized the molecular mechanisms underlying CD70-mediated apoptosis in EBV-transformed B cells. We examined ROS production after CD70 stimulation because a previous study demonstrated that ROS participate in apoptosis (31). Increase of ROS production was detected at 2 h after CD70 stimulation (Fig. 3A). NAC, a quencher of ROS, effectively blocked both apoptosis and disruption of membrane potential of mitochondria (Fig. 3B). We analyzed cell cycle arrest using BrdU and PI dye and found that CD70 stimulation significantly increased the number of sub-G1 cells (44.79%; Fig. 3C), indicating DNA fragmentation, a hallmark of apoptosis. NAC also interfered with increases of sub-G1 cells (Fig. 3C). ROS can lead to ER stress that may cause Ca2+ release, and it can be produced either directly or indirectly in the mitochondria (1, 32). Uncontrolled cytosolic Ca2+ overload is a common cause of cell death in several pathological conditions, therefore we analyzed Ca2+ concentration. EBV-transformed B cells were treated with anti-CD70 mAb for 24 h and loaded with Ca2+-sensitive dye fluo-3-AM to measure cytosolic Ca2+ levels. Compared with isotype control-treated cells, treatment with anti-CD70 Ab resulted in an increase in cytosolic Ca2+, which was detected 4 h after CD70 stimulation (Fig. 4A). To verify the influence and role of calcium in the progression of CD70-induced apoptosis, we employed a calcium-inhibiting agent, BAPTA-AM (2 μM), which diminishes intracellular Ca2+ concentration. As illustrated in Fig. 3B, BAPTA greatly reduced the level of apoptosis and intracellular Ca2+ concentration but did not block ROS generation. However, NAC completely inhibited cytosolic Ca2+ levels (Fig. 4B, right bottom). These results indicate that ROS generation might precede increase of intracellular Ca2+. ROS-dependent apoptosis in EBV-transformed B cells after CD70 stimulation. EBV-transformed B cells were incubated with anti-CD70 mAb (1 μg/ml) or MOPC21 (1 μg/ml) and secondary Abs (2 μg/ml). Cells were harvested and further incubated in medium for 10 min or 2, 4, 8, 16, 24, or 48 h (A) and for 24 h (B, C). N-Acetylcysteine (NAC) treatment was performed as described in Materials and Methods. A and B, To measure ROS production, cells were preincubated with DCFH-DA before treatment with Ab. The percentage given is the percentage of cells. The numbers in the DCF histograms indicate MFI. Thin-line and thick-line histograms represent the ROS level of MOPC21 (isotype control) and anti-CD70 Ab-treated cells, respectively. Apoptotic cells were detected by staining with FITC-conjugated annexin V and PI. Diminished DiOC6 fluorescence indicates disruption of membrane potential of mitochondria. Negative groups mean no treatment with any mAb. A representative example of three independent experiments is shown. C, To assess the level of sub-G1, cells were fixed with BD Cytofix/Cytoperm and stained with BrdU and PI as described in Materials and Methods and then analyzed by flow cytometry. The R5 percentage represents the fraction of sub-G1 cells relative to the total number of cells (R2, G0–G1 phase; R3, S phase; R4, G2–M phase; R5, sub-G1 phase). CD70 induced an increase in cytosolic calcium concentration, and calcium antagonist BAPTA affected CD70-induced apoptosis and Ca2+ levels in EBV-transformed B cells. Cells were pretreated with BAPTA-AM (2 μM, 30 min) to inhibit increase of Ca2+. Cells were stimulated with Abs (primary, 1 μg/ml; secondary, 2 μg/ml) and further incubated in medium for 0.5, 1, 2, 4, 6, or 8 h (A) and for 24 h (B). Ca2+ levels (fluo-3-AM) were obtained as described in Materials and Methods. Thin-line and thick-line histograms represent untreated cells (negative control) and MOPC21 (isotype control) or anti-CD70 mAb-treated cells, respectively. The numbers in the histograms indicate MFI. A representative example of four independent experiments is shown. When mitochondrial membranes are disrupted, mitochondria release several proapoptotic molecules that are deeply related to caspase activities. In addition, ROS is involved in protease cascades such as caspase cascades (31). For that reason, we performed immunoblot to examine pro-/anti-apoptotic proteins and caspases after disruption of membrane potential of mitochondria. Protein extraction and calculation of sample in each lane were performed with the greatest care because the proportion of dead cells was increased after CD70 stimulation. Bcl-2 and Bcl-XL were constitutively translated in EBV-transformed B cells but prominently downregulated after CD70 engagement. CD70 stimulation induced Bid truncation in a time-dependent manner. Moreover, CD70 stimulation induced the activation of caspase-9, the apical caspase in the mitochondrial apoptosis pathway. There were also increases in the cleavage of the effector caspase, caspase-3, and its substrate PARP (Fig. 5A), which were involved in DNA fragmentation. EBV-transformed B cells were pretreated with z-VAD-fmk, a pan-caspase inhibitor, or z-DEVD-fmk, a caspase-3 inhibitor, for 2 h before CD70 stimulation. Z-VAD-fmk effectively blocked CD70-mediated apoptosis, but z-DEVD-fmk did a partial inhibition compared with that of z-VAD-fmk. Both z-VAD-fmk and z-DEVD-fmk inhibited △ψm disruption, but they had no influence on ROS production (Fig. 5B). Z-VAD-fmk also blocked the appearance of sub-G1 cells, indicating that this process was caspase dependent (data not shown). 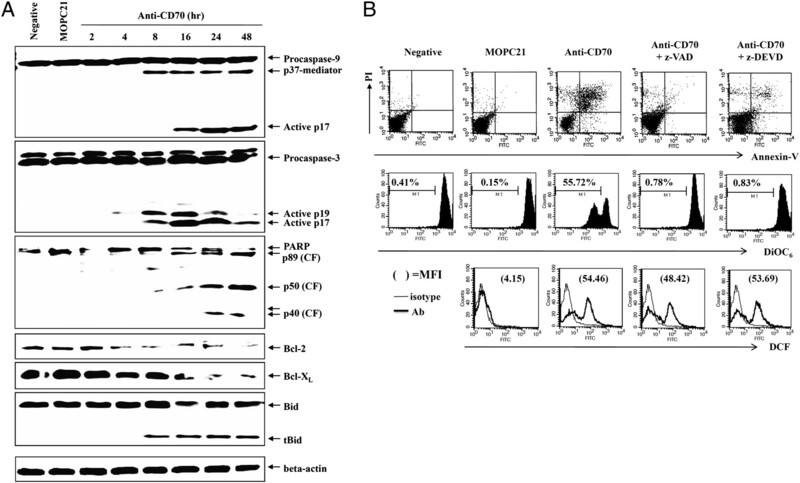 Involvement of caspases and pro-/anti-apoptotic proteins in CD70-mediated apoptosis. A, EBV-transformed B cells were stimulated with Abs (primary, 1 μg/ml; secondary, 2 μg/ml) and further incubated in medium for 2, 4, 6, 8, 16, 24, or 48 h. Total cell lysates were collected and subjected to Western blot using anti–Bcl-2, anti–Bcl-XL, anti-Bid, anti–caspase-9, anti–caspase-3, and anti-PARP Abs. β-Actin was used as an internal control. A representative example of three independent experiments is shown. B, Cells were pretreated with 20 μM z-VAD-fmk or 20 μM z-DEVD-fmk for 2 h and stimulated with Abs (1 μg/ml) for 24 h. The number of apoptotic cells (annexin V/PI), △ψm (DiOC6), and ROS level (DCF) were obtained as described in Materials and Methods. The indicated percentage indicates the mitochondrial membrane potential disrupted cell proportion. The numbers given in the DCF histograms indicate MFI. Negative denotes no treatment group, and isotype denotes MOPC21-treated group. CF, cleavage form. Uncontrolled cytosolic Ca2+ overload is related to ER stress, thus we next studied how the ER is involved in CD70-mediated apoptosis. We first determined a number of markers that are consistently expressed during ER-induced apoptosis and UPR. The UPR pathway induces expression of the ER chaperone GRP78, which serves as a gatekeeper to the activation of ER stress transducers, and transcription factor CHOP. Transcription of GRP78 mRNA was detected at 2 h after CD70 stimulation although it was remarkable at 8 h. Transcription of CHOP mRNA was gradually increased at 2 h (Fig. 6A, Table I). Both GRP78 and CHOP proteins were detected by immunoblot at 2 h (Fig. 6B), which is much earlier than the activation of caspase-9 and caspase-3 as shown in Fig. 5A. Additionally, activation of three sensor proteins of ER stress, namely IRE1, ATF6, and PERK was examined via monitoring their downstream targets. Activation of ATF6 induced expression of XBP-1 mRNA, and the activated IRE1 spliced XBP-1 mRNA. As depicted in Fig. 6A, sXBP-1 mRNA increased over the first 2 h of CD70 stimulation, indicating that both ATF6 and IRE1 were activated 2 h after CD70 stimulation. Finally, PERK can be identified by the presence of its target molecules, GADD34 and the transcription factor ATF4. We found that mRNA of GADD34 and ATF4 increased (Fig. 6A). The increase in phosphorylation of PERK was also detected by immunoblot 2 h after incubating cells with anti-CD70 mAb (Fig. 6B). In addition, caspase-4 can be activated by ER stress. We therefore investigated whether caspase-4 was activated in EBV-transformed B cells after CD70 stimulation. Caspase-4 was activated at 16 h after treatment with anti-CD70 mAb, as shown from the decrease of procaspase-4 and the increase of cleavage fragment (Fig. 6B). According to these results, GRP78, CHOP, IRE1, ATF6, and PERK, which are related to ER stress, seem to be involved in CD70-induced apoptosis. Involvement of ER stress markers in CD70-mediated apoptosis. EBV-transformed B cells were stimulated with anti-CD70 mAb (1 μg/ml) or MOPC21 (isotype control, 1 μg/ml) and goat anti-mouse IgG. A, Cells were harvested and further incubated in medium for 1, 2, 4, 6, 8, or 12 h. Total RNA was extracted from cell lysates, cDNA was synthesized, and quantitative real-time RT-PCR for GRP78, CHOP, GADD34 as target of PERK, ATF4 as target of PERK, sXBP-1 as target of IRE1 and ATF6, and β-actin mRNA was performed, and mRNA fold induction values were calculated as described in Materials and Methods. Experiments were performed in triplicate. B, Time-dependent induction of terminal/proapoptotic ER stress proteins and caspase-4. Cells were stimulated for 2, 4, 8, 16, 24, or 48 h, and then total cell lysates were collected. Whole-cell lysates were subjected to Western blot using anti-PERK, anti-GRP78, anti-CHOP, or anti–caspase-4. β-Actin was used as an internal control. A representative example of three independent experiments is shown. To confirm the involvement of ER stress in CD70-induced apoptosis, we compared the effects of anti-CD70 mAb on induction of apoptosis in the absence or presence of salubrinal. Salubrinal inhibits eIF2-α dephosphorylation and is known to protect cells from ER stress by reducing translational activity and lowering protein load. The presence of salubrinal significantly protected EBV-transformed B cells from CD70-induced apoptosis and mitochondrial membrane permeabilization (Fig. 7A). CD70-induced cleavage of caspase-9, -4, -3, and PARP and cytochrome c release were also dramatically inhibited by salubrinal (Fig. 7B, 7C). Effect of salubrinal on CD70-mediated apoptosis, production of ER stress marker, and activity of caspases. EBV-transformed B cells were pretreated with 2 μM salubrinal or DMSO at 37°C for 1 h. Cells were stimulated with anti-CD70 mAb (1 μg/ml) or MOPC21 (isotype control, 1 μg/ml) and goat anti-mouse IgG. Cells were harvested and further incubated in medium for 24 h. A, The number of apoptotic cells (annexin V/PI) and △ψm (DiOC6) were obtained as described in Materials and Methods. The indicated percentage is the cell proportion in each quadrant and bar. Negative indicates cells not treated with Ab. A representative example of three independent experiments is shown. B, Cells were harvested, and amounts of cytochrome c in cytosol and mitochondria fractions were determined. The mitochondria marker Hsp60 and cytosol marker β-tubulin were used to verify the purity of each fraction and were also used as loading controls. Cytosolic and mitochondrial fractionations were performed as described in Materials and Methods. C, Cells were harvested for preparation of whole-cell protein lysates for detection of the indicated proteins by Western blot analysis. A representative example of four independent experiments is shown. CF, cleavage form. We next assessed proteolytic activities of MAPKs using immunoblot because ER stress markers were regulated by kinase activates in upstream cell signaling, including the p38-MAPK, JNK, and ERK1/2 pathways. It has been reported that ER stress and CHOP expression are also regulated by JNK activation (33). SAPK/JNK MAPK-dependent cell apoptosis has already been demonstrated in B cell malignancies (34) and after ER stress induction (35). We observed that the engagement of CD70 led to upregulation of the phosphorylated form of ERK1/2, p38-MAPK, JNK, and c-jun at 2 h (Fig. 8A), which is much earlier than the activation of caspase-9, caspase-3, and PARP. In addition, we used specific MAPK inhibitors, including SP600125, SB203580, and PD98059, which inhibit JNK, p38 MAPK, and ERK1/2, respectively. All of the inhibitors blocked CD70-induced apoptosis and mitochondrial membrane disruption, although the effect of PD98059 was relatively low (Fig. 8B). Three inhibitors inhibited CD70-induced caspase-9 and caspase-3 activation and PARP cleavage (data not shown). Pretreatment with SP600125 and SB203580 effectively blocked upregulation of CHOP, GADD34, ATF4, and sXBP-1 and activation of caspase-4 at mRNA and protein levels (Fig. 8C, 8D). However, neither inhibitor blocked the elevation of GRP78 expression in cells. Notably, inhibition of ERK1/2 using PD98059 had no influence on expression of ER stress-associated molecules. JNK and p38 MAPK activation is related to ER stress-mediated apoptosis. A, EBV-transformed B cells were stimulated with Abs (primary, 1 μg/ml; secondary, 2 μg/ml) and further incubated in medium for 2, 4, 6, 8, 16, 24, or 48 h. Total cell lysates were collected and subjected to Western blot using anti-p38 MAPK, anti-JNK, or anti–c-jun Ab. β-Actin was used as an internal control. A representative example of three independent experiments is shown. B–D, Cells were pretreated with 25 μM SP600125, 10 μM SB203580, and 10 μM PD98059 at 37°C for 1 h. Cells were stimulated with Abs and then further incubated in medium for 6 h to determine mRNA level (C) or for 24 h to determine protein level (D). A representative example of three to five independent experiments is shown. B, The number of apoptotic cells (annexin V/PI) and △ψm (DiOC6) were obtained. The indicated percentage is the cell proportion in each quadrant and bar. C, Total RNA was extracted from cell lysates, cDNA was synthesized, quantitative real-time RT-PCR for GRP78, CHOP, GADD34, ATF4, sXBP-1, and β-actin mRNA was performed, and mRNA fold induction values were calculated as described in Materials and Methods. D, Cells were harvested and then total cell lysates were collected. Whole-cell lysates were subjected to Western blot using anti-GRP78, anti-CHOP, and anti–casapse-4 Abs. β-Actin was used as an internal control. 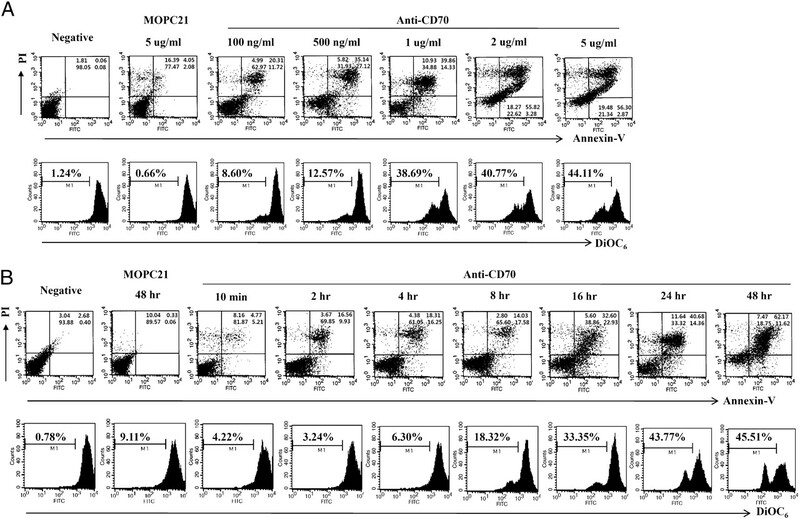 Negative indicates nontreated cells, and MOPC21 indicates isotype control. To elucidate the mechanistic order of ROS production, MAPK signaling, and ER stress, cells were incubated with NAC, an ROS quencher, prior to anti-CD70 mAb treatment. The results showed that NAC significantly attenuated CD70-induced activation of GRP78 and PERK, as well as abrogated the expression of ATF4, CHOP, and sXBP-1 after CD70 stimulation (Fig. 9A, 9B). NAC also blocked increases of p-JNK, p–c-jun, and p-p38 MAPK (Fig. 9B). Together with previous results, these data indicate that ROS play a major role as an upstream regulatory molecule in ER stress and mitochondrial dysfunction during CD70-mediated apoptosis in EBV-transformed B cells. Effect of N-acetylcysteine (NAC) on CD70-induced ER stress-mediated apoptosis, JNK and p38 MAPK activation, and production of ER stress marker. EBV-transformed B cells were pretreated with 10 mM N-acetylcysteine for 1 h. Cells were stimulated with anti-CD70 mAb (1 μg/ml) or MOPC21 (1 μg/ml) and goat anti-mouse IgG (2 μg/ml). Cells were further incubated in medium for 6 h to determine mRNA level (A) or for 24 h to determine protein level (B). A, RT-PCR for GRP78, CHOP, GADD34, ATF4, sXBP-1, and β-actin mRNA was performed as described in Materials and Methods. A representative example of three independent experiments is shown. B, Whole-cell lysates were subjected to Western blot using anti-p38 MAPK, anti-JNK, anti–c-jun, anti-GRP78, anti-PERK, and anti-CHOP Abs. β-Actin was used as an internal control. A representative example of four independent experiments is shown. Several tumor cell lines express CD70. We found that CD70 was expressed on Raji, IM-9, and Daudi, which are of B cell origin. We also detected CD70 on NCI-H460, a large-cell lung cancer cell line, and on OVCAR-3, an ovarian cancer cell line (Supplemental Fig. 2). Next, we checked whether ER stress-mediated apoptosis of other CD70-expressing tumor cells as well as EBV-transformed B cells also occurred after stimulation of CD70. After incubation with anti-CD70 mAb (1 μg/ml), Raji, IM-9, and NCI-H460 underwent apoptosis (Fig. 10A) and upregulation of CHOP (Fig. 10B). These data suggest that CD70 on not only B cells but also other cells may trigger ER stress-mediated apoptosis. ER stress-mediated apoptosis of Raji, IM-9, and NCI-H460 after CD70 stimulation. CD70 stimulation using anti-CD70 mAb was performed on CD70+ tumor cell lines. Raji, IM-9 (B cell cancer cell line), and NCI-H460 (large-cell lung cancer cell line) were stimulated with anti-CD70 mAb (1 μg/ml) or MOPC21 (isotype control, 1 μg/ml) and goat anti-mouse IgG (2 μg/ml) for 24 h. A, Aoptotic cells were detected by staining with FITC-conjugated annexin V and PI. The indicated percentage is the cell proportion in each quadrant. B, Total cell lysates were collected and subjected to Western blot using anti-CHOP Ab. β-Actin was used as an internal control. A representative example of three independent experiments is shown. CD70 is expressed only on the surfaces of highly activated B cells, T cells, and dendritic cells (21). Studies on CD70 are mainly focused on its role as a CD27 ligand. For example, CD70 ligation to CD27 on the surfaces of memory B cells induces activation and differentiation into plasma cells (36), whereas on the surfaces of T cells it promotes differentiation of CTLs in the absence of CD4+ T cell help (19). Stimulation of CD70 on B cells also supports proliferation of B cells and regulates Ig production (28). Although studies about CD70 itself are relatively scarce, CD70 has been shown to be a possible target for immunotherapy. Several reports have shown that CD70 expression is observed in various cancer cells (21–24), suggesting that CD70 may be involved in cancer progression and malignancy. 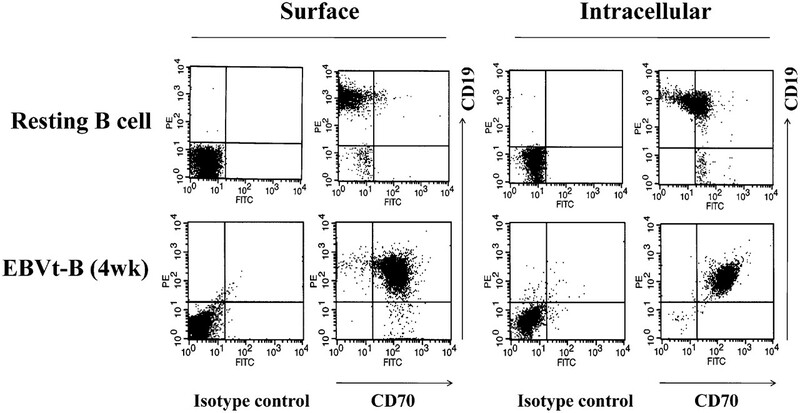 In agreement with previous studies, we observed that CD70 was not expressed on the surfaces of resting B cells from healthy human donors, but CD70 was transported from the cytosol onto B cell surface after 4-wk EBV infection (Fig. 1). Like rituximab (anti-CD20) and alemtuzumab (anti-CD52), anti-CD70 immunotherapy has been tried and has been shown to induce apoptosis in human cancer cells such as renal cell carcinoma cells (25) and EBV+ Burkitt’s lymphoma cells (26). Complement-dependent cytotoxicity is strongly related to CD70-mediated cell death, however, direct apoptosis through signal transduction was not excluded as a possible mechanism because CD70 has a short cytoplasmic tail. In the current study, we have demonstrated that CD70 stimulation decreased the percentage of viable EBV-transformed B cells through induction of apoptosis without complement (Fig. 2). Moreover, CD27-Ig fusion protein, a physiologic ligand of CD70, also induced apoptosis on CD70+ EBV-transformed B cells (Supplemental Fig. 1). According to these results, we presume that soluble CD27 secreted from lymphoid cells stimulates CD70-mediated apoptosis, namely CD27/CD70 interaction may act as paracrine on adjacent cells. Other studies using soluble CD27 and/or CD70 also support this possibility (37–39). Next, we investigated apoptogenic events and signal transduction after CD70 stimulation. Eventually, CD70-mediated apoptosis was induced via ROS generation and mitochondria-dependent pathway. It has been demonstrated that mitochondrial alterations constitute critical events of the apoptotic cascade, and the reduction of △ψm is an early step of apoptosis, followed by cytochrome c release in many cell types. As shown in Fig. 2, EBV-transformed B cells treated with anti-CD70 mAb for various time periods showed a time-dependent reduction of △ψm, indicating that CD70 stimulation decreased the level of △ψm in EBV-transformed B cells. Notably, increase of ROS generation was detected at 2 h, and disruption of membrane potential of mitochondria was detected at 8 h. These results suggest that ROS generation may precede disruption of membrane potential of mitochondria. CD70 stimulation also increased Bax, Bad (data not shown), and tBid and inhibited the levels of Bcl-2 and Bcl-XL, leading to the disruption of membrane potential of mitochondria and release of cytochrome c from mitochondria to cytosol (Figs. 5A, 7B). This was followed by caspase-3 activation, finally resulting in apoptosis. Additionally, our data demonstrated that cross-linking of CD70 induced elevation of cytoplasmic Ca2+, which plays an important role in induction of apoptosis. We showed that during pretreatment of anti-CD70 mAb–treated EBV-transformed B cells with BAPTA, the increase of cytoplasmic Ca2+ was suppressed, as was the proportion of apoptosis (Fig. 4B). This is in accordance with other reports that demonstrate that increased Ca2+ influx leads to cell death under normal circumstances. NAC pretreatment blocked increase of Ca2+ after CD70 stimulation (Fig. 4B, right bottom), but BAPTA did not block increase of ROS production (Fig. 4B, left bottom). This suggests that ROS might modulate Ca2+ concentration related to ER stress, and ROS generation might precede increase of Ca2+ after CD70 stimulation. Our results that increased Ca2+ level was detected at 4 h (Fig. 4A) but increase of ROS was detected prior to increased Ca2+ at 2 h (Fig. 3A) supported this hypothesis. Finally, an increase in Ca2+ concentration and ROS generation are essential to CD70-mediated apoptosis. It has been established that ER stress not only favors the survival of cells but also induces apoptosis in various types of cells (2). Therefore, the decision between survival and apoptosis may depend on the balance between survival signaling and apoptotic signaling. Cells initially adapt to the accumulation of unfolded proteins by inducing the expression of ER-resident molecular chaperones as well as by inhibiting new protein synthesis. However, if this adaptation does not prove sufficient, the apoptotic response is initiated via induction of ER-associated apoptotic molecules. Among the ER-associated apoptotic molecules, CHOP and caspase-4 are key proapoptotic factors that are closely associated with ER stress (12). The ER stress or terminal/proapoptotic UPR is induced by nutrient deprivation or chemical agents that cause or prolong ER stress. We therefore hypothesized that increased ER stress after treatment with anti-CD70 mAb would lead to proapoptotic/terminal UPR and consequently induce apoptosis in EBV-transformed B cells. As expected, cross-linking CD70 induced increase of intracellular Ca2+ concentration and apoptosis (Fig. 4). All ER-related events were observed within a period of 1∼2 h after CD70 stimulation, whereas mitochondria-related apoptosis events, such as caspase activation, occurred 8∼16 h after stimulation (Figs. 5A, 6). These results suggest that CD70-mediated apoptosis induces excessive ER stress at an early stage, prior to the mitochondria response. Notably, we detected activation of caspase-9 at 8 h and caspase-4 at 16 h after CD70 stimulation. ER-associated caspase-4 has been reported to act upstream of caspase-9 in cephalostatin-induced apoptosis, and it was found that this process is independent of Apaf-1 and cytochrome c (40). However, it has also been reported that caspase-4 is not required for caspase-dependent ER stress-induced apoptosis (41). Thus, we suggest that caspase-4 was activated independent of other caspases and resulted from CD70-induced ER stress. Moreover, we did not rule out the involvement of caspase-8. Activated caspase-8 inactivates flippase to externalize phosphatidylserine (annexin V positive) (42). It is possible to explain how annexin V-positive cells were detected at 2 h although the activations of caspase-3 and caspase-9 were detected at 8 h. This point will be examined in future studies. It is well known that GRP78 and CHOP are typical ER stress-regulated proteins involved in ER stress-induced apoptosis (5). Thus, our findings that GRP78 and CHOP are induced after CD70 stimulation suggest that cross-linking of CD70 may trigger ER stress. Moreover, CD70 stimulation increased levels of ATF4, sXBP-1, GADD34, and phosphorylation of PERK during ER stress (Fig. 6). Salubrinal is a selective inhibitor of eIF2-α dephosphorylation and blocks ER stress-induced apoptosis. Pretreatment with salubrinal protected EBV-transformed B cells from CD70-mediated apoptosis, mitochondrial disruption, caspase activation, and release of cytochrome c to cytosol (Fig. 7). Therefore, it seems that CD70-mediated apoptosis involves ER stress. Both JNK and CHOP are implicated in mediating ER stress-induced apoptosis (4). A recent study suggested that JNK activation during ER stress contributes to CHOP expression (34). Based on these previous data, we hypothesized that ER stress-induced apoptosis after CD70 stimulation involves the MAPK signaling pathways JNK, p38 MAPK, and ERK1/2. SP600125 and SB203580 efficiently blocked CD70-mediated apoptosis, mitochondrial disruption, ER stress markers, and caspase-4 (Fig. 8B–D). We confirmed that CD70 stimulation induced activation of JNK and p38 MAPK pathway using immunoblot (Fig. 8A). It has recently been published that ROS mediates ER stress and mitochondrial dysfunction (43), and we have now demonstrated that the presence of NAC inhibited ER stress markers, JNK, and p38 MAPK (Fig. 9) as well as apoptosis (Fig. 3B, 3C). These findings suggest that ROS generation precedes the other events after CD70 stimulation. However, pretreatment with PD98059, an ERK1/2 inhibitor, did not block CHOP, GADD34, ATF4, or xXBP-1 even though it blocked CD70-mediated apoptosis (Fig. 8B–D). These results indicate that PD98059 inhibits CD70-mediated apoptosis via unknown pathway that does not involve CHOP, ATF6, IRE1, and PERK. Additional studies are needed to better elucidate this pathway. Additionally, none of the MAPK inhibitors altered the increase of GRP78 after CD70 stimulation (Fig. 8C, 8D). Because the order of the events related to ER stress is not clear, it is difficult to explain how MAPK inhibitors could block ER stress-related apoptosis without inhibition of GRP78. One possibility is that upper pathway inhibition points of these chemicals might be involved in GRP78 modulation, although further studies will be required to resolve this discrepancy. In addition, cross-linking of CD70 induced ER stress-mediated apoptosis of Raji, IM-9, and NCI-H640 as well as EBV-transformed B cells (Fig. 10). Raji, IM-9, and EBV-transformed B cells originate from B cells, but NCI-H640 is derived from lung cancer. This result suggests that ER stress-mediated apoptosis by cross-linking of CD70 is not confined to cells of B cell lineage. Taken together, we conclude that cross-linking of CD70 induced ROS-mediated ER stress and subsequently provoked ER stress-mediated apoptosis via Ca2+ release from ER, JNK/p38 MAPK pathway activation, cytochrome c release from mitochondria, and caspase activation in EBV-transformed B cells. This is supported by the observation that anti-CD70 mAb is able to induce direct apoptosis of CD70+ tumors when used with complement activation in vivo. These results contribute to the understanding of the function of CD70 and provide data in support of CD70 as a potentially effective therapeutic modality for treating CD70-expressing tumors. This work was supported by the Science Research Center/Engineering Research Center program of Ministry of Science and Technology/Korea Science and Engineering Foundation (Grant R11-2005-017), the National R&D Program for Cancer Control, Ministry for Health, Welfare and Family Affairs, Republic of Korea (Grant 0920040), and the 2009 Inje University Research Grant.
. 2002. Calcium and oxidative stress: from cell signaling to cell death. Mol. Immunol. 38: 713–721.
. 2006. Endoplasmic reticulum stress and apoptosis. Cell. Mol. Biol. Lett. 11: 488–505.
. 2006. Mediators of endoplasmic reticulum stress-induced apoptosis. EMBO Rep. 7: 880–885.
. 2004. Signaling the unfolded protein response from the endoplasmic reticulum. J. Biol. Chem. 279: 25935–25938.
. 2004. Roles of CHOP/GADD153 in endoplasmic reticulum stress. Cell Death Differ. 11: 381–389.
. 2007. Increase in intracellular Ca(2+) concentrations and the corresponding intracellular acidification are early steps for induction of apoptosis by geranylgeraniol in HL60 cells. Biol. Pharm. Bull. 30: 880–884.
. 2003. Cell biology. Apoptosis—the calcium connection. Science 300: 65–67.
. 2004. Calcium, ATP, and ROS: a mitochondrial love-hate triangle. Am. J. Physiol. Cell Physiol. 287: C817–C833.
. 2005. Proapoptotic BAX and BAK regulate the type 1 inositol trisphosphate receptor and calcium leak from the endoplasmic reticulum. Proc. Natl. Acad. Sci. USA 102: 105–110.
. 2000. Cross-talk between two cysteine protease families. Activation of caspase-12 by calpain in apoptosis. J. Cell Biol. 150: 887–894.
. 2002. Human caspase 12 has acquired deleterious mutations. Biochem. Biophys. Res. Commun. 293: 722–726.
. 2004. 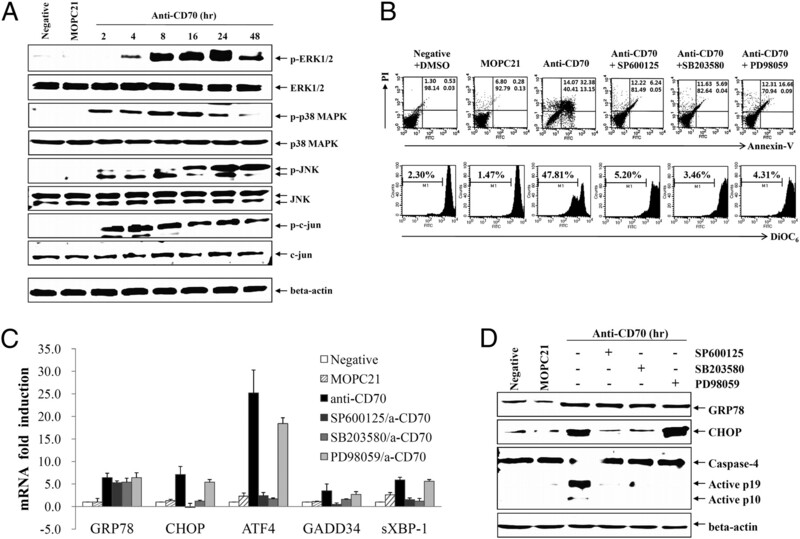 Involvement of caspase-4 in endoplasmic reticulum stress-induced apoptosis and Abeta-induced cell death. J. Cell Biol. 165: 347–356.
. 1997. p28 Bap31, a Bcl-2/Bcl-XL- and procaspase-8-associated protein in the endoplasmic reticulum. J. Cell Biol. 139: 327–338.
. 2002. BH-3-only BIK functions at the endoplasmic reticulum to stimulate cytochrome c release from mitochondria. J. Biol. Chem. 277: 18053–18060.
. 2003. BAX and BAK regulation of endoplasmic reticulum Ca2+: a control point for apoptosis. Science 300: 135–139.
. 2005. CD27 and CD70 in T cell and B cell activation. Curr. Opin. Immunol. 17: 275–281.
. 2001. Constitutive CD27/CD70 interaction induces expansion of effector-type T cells and results in IFNgamma-mediated B cell depletion. Immunity 15: 801–812.
. 2000. CD27 is required for generation and long-term maintenance of T cell immunity. Nat. Immunol. 1: 433–440.
. 1995. Expression of CD27 and its ligand, CD70, on chronic lymphocytic leukemia B cells. Blood 85: 3556–3565.
. 1997. B lymphocytes from patients with chronic lymphoproliferative disorders are equipped with different costimulatory molecules. Cancer Res. 57: 4940–4947.
. 1998. Burkitt-like lymphomas in AIDS patients: characterization within a series of 103 human immunodeficiency virus-associated non-Hodgkin’s lymphomas. J. Clin. Oncol. 16: 3788–3795.
. 2008. Potent anticarcinoma activity of the humanized anti-CD70 antibody h1F6 conjugated to the tubulin inhibitor auristatin via an uncleavable linker. Clin. Cancer Res. 14: 6171–6180.
. 2006. Lymphocyte activation antigen CD70 expressed by renal cell carcinoma is a potential therapeutic target for anti-CD70 antibody-drug conjugates. Cancer Res. 66: 2328–2337.
. 2005. Anti-CD70 antibodies: a potential treatment for EBV+ CD70-expressing lymphomas. Mol. Cancer Ther. 4: 2037–2044.
. 2008. Preclinical characterization of SGN-70, a humanized antibody directed against CD70. Clin. Cancer Res. 14: 7763–7772.
. 2004. Signaling through CD70 regulates B cell activation and IgG production. J. Immunol. 173: 3901–3908.
. 2004. Signalling via CD70, a member of the TNF family, regulates T cell functions. J. Leukoc. Biol. 76: 263–270.
. 2008. Cross-linking of B7-H1 on EBV-transformed B cells induces apoptosis through reactive oxygen species production, JNK signaling activation, and fasL expression. J. Immunol. 181: 6158–6169. 1996. Reactive oxygen species and programmed cell death. Trends Biochem. Sci. 21: 83–86.
. 2005. Mitochondrial metabolism of reactive oxygen species. Biochemistry (Mosc.) 70: 200–214.
. 2004. Elevated gadd153/chop expression and enhanced c-Jun N-terminal protein kinase activation sensitizes aged cells to ER stress. Exp. Gerontol. 39: 735–744.
. 2006. Perifosine, an oral bioactive novel alkylphospholipid, inhibits Akt and induces in vitro and in vivo cytotoxicity in human multiple myeloma cells. Blood 107: 4053–4062.
. 2008. Coupling of endoplasmic reticulum stress to CDDO-Me-induced up-regulation of death receptor 5 via a CHOP-dependent mechanism involving JNK activation. Cancer Res. 68: 7484–7492.
. 1998. Generation of plasma cells from peripheral blood memory B cells: synergistic effect of interleukin-10 and CD27/CD70 interaction. Blood 91: 173–180.
. 2010. Soluble CD70: a novel immunotherapeutic agent for experimental glioblastoma. J. Neurosurg. 113: 280–285.
. 2006. Immune escape for renal cell carcinoma: CD70 mediates apoptosis in lymphocytes. Neoplasia 8: 933–938.
. 2006. 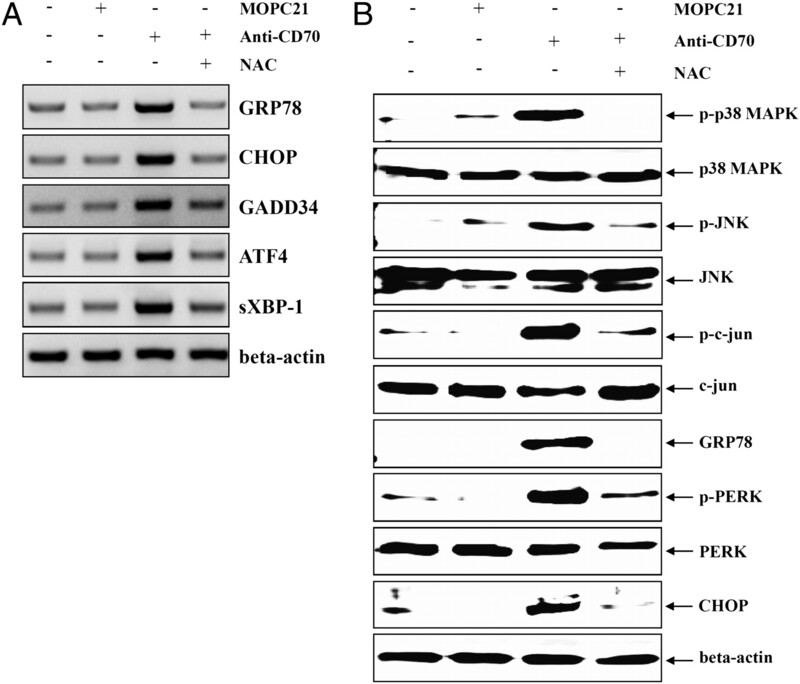 The marine product cephalostatin 1 activates an endoplasmic reticulum stress-specific and apoptosome-independnet apoptotic signaling pathway. J. Biol. Chem. 281: 33078–33086.
. 2005. Caspase-12 and caspase-4 are not required for caspase-dependent endoplasmic reticulum stress-induced apoptosis. J. Biol. Chem. 280: 29578–29587.
. 2005. Fas-, caspase 8-, and caspase 3-dependent signaling regulates the activity of the aminophospholipid translocase and phosphatidylserine externalization in human erythrocytes. J. Biol. Chem. 280: 39460–39467.
. 2009. Sodium selenite induces apoptosis by ROS-mediated endoplasmic reticulum stress and mitochondrial dysfunction in human acute promyelocytic leukemia NB4 cells. Apoptosis 14: 218–225.